When it comes to perfume, I’m usually not so concerned about the “youthfulness” of a fragrance, OR the opposite — a fragrance’s “mature” vibe. I like and wear both “young,” fun fragrances and more staid, “classical” scents, so I approached the two Ed Hardy men’s fragrances with an open mind. Ed Hardy Man contains bergamot, mandarin, clary sage, thuja, Mint Julep accord with ozone, musk, Sequoia Forest note, and amber. Ed Hardy Man opens with our old friend, the predictable, but “warm,” bergamot; there is also a dollop of mint, a hint of mandarin. Ed Hardy Man’s opening reminds me of a personal favorite, Guerlain Habit Rouge; the heart of the fragrance smells of vanilla cookies (store-bought). The base of Ed Hardy Man has a soft, woody-amber and gauzy-musk aroma, and the fragrance ends up smelling fuzzy and comfortable. I can detect ozone in the formula, but it’s a quiet ozone note. The extreme dry-down of Ed Hardy Man is very much like Givenchy Pi (tepid citrus clouded by vanillic benzoin). Ed Hardy Man (to me) is a fragrance for winter; it’s too sweet and warm for hot-weather wear. Ed Hardy Love & Luck Man includes notes of bergamot, orange, mandarin, cardamom, absinthe, sage, cypress, violet, musk, cedar, vetiver and agarwood. Love & Luck Man goes on lighter and has brighter, cooler citrus notes than Ed Hardy Man. Love & Luck Man’s mandarin-orange notes provide a steady stream of fruitiness; there’s also a subtle herbal-green accord and an aquatic-violet aroma. Agarwood? I don’t smell it; if it’s in the fragrance it must be in miniscule portion. Love & Luck Man is a good (sensible) addition to the Ed Hardy men’s fragrance range since it fits into the “summer slot” for men. Love & Luck Man is VERY “fresh” and its notes turn talc-y within a half hour on my skin. The Ed Hardy men’s fragrances were created by perfumer Olivier Gillotin and retail for $55 (50 ml) and $75 (100 ml). Kevin, when you have your Halloween ensemble complete, PLEASE post a photo for us! FC&G: HA! NST readers would never think of me in the same way again! I'm almost sorry that Ed Hardy has gotten so…mainstream? Trendy? Cliche? I don't know. The man himself is so unlike all this. He's a great tattooer and a really interesting fine artist as well – he was one of the first tattooers to set forth an example of tattooer as artist in his/her own right. I attended a gallery opening of his and was knocked out. His shop was the first one I went to – I knew I couldn't get a badly done tat in there, and my tattooer was one of his good friends and proteges. I have mentioned this before but none of the Hardy fragrances speak “tattoo” to me, but if it was my formulation, nobody would wear it but those in the “know” – lol. I'm sure he is plenty happy making a buttload of money, and I personally really like the sneakers. I have a hard time wearing tattoo images, because I have plenty of real tattoos and it seems weird. And then you can wear the same outfit — spray tan and all — to star in a sequel to “The Wrestler”! lilydale: “Sweet Smellin' K” would be my ring name…and I'll need to start growing out my hair! Tama: I did look at Hardy's website and liked some of his work…and you are right, these scents do NOT say “TATTOO!” to me either. your post put the first real smile on my face all day. hee. sockmonkey: glad to hear it! I WANT that bracelet!!! I had bever heard of this brand and don't think it makes its' way to Australia but I have to get my hands on it some how. Any suggestions of online sites to purchase? AussieBec: look at http://www.neimanmarcus.com…I think they have it. The scents do not say “tattoo” to me, either. Hardy's designs are great tattoos and such, and am happy for him to be doing all the things he's doing. The scents sound alright; have to find them to try them out! 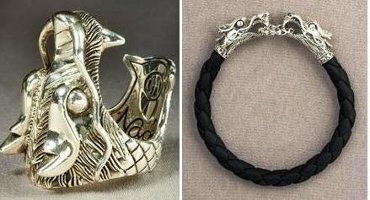 You might be able to also find the bracelets at places like Bergdorf's or Nordstrom's in New York City. They would be happy to deliver, no doubt! CB & AussieBec: looks like http://www.lanecrawford.com in Hong Kong carries the line too…closer to Australia. K: Those boxer briefs are a nightmare. I may now also have a nightmare about showing up to give a speech somewhere wearing only them. I'm definitely not the target demographic. Fun review though. Thanks I found it and now I am going to order it!!! yay!!! Yesterday was 45.7 degrees celcius which is nearly 115 degrees fahrenheit. I can't find a thing to wear in my perfume cabinet that I could bear. Those boxerbriefs are the worst thing I have seen in my entire life. in their celebrity gallery they have a picture of my favorite TV personality, Gülcan, but they called her Gylcan D:< D:< a nd she's wearing a tanktop with the same tiger as those boxerbriefs! Oh my god for your laptop you can get a huge decal thing of that tiger with over 7,000 rhinestones. You can even ~*bling out*~ your blackberry with that tiger. I'm going to make that tiger that ~*signature*~, I need Ed Hardy Man!!!! AussieBec: HORRORS! Maybe pour on a bottle of ice cold sparkling water? joe: the boxers are somethin' else! Kroko: the tiger is EVERYWHERE…must be popular! I'm a 19 year old girl so I technically fit the demographic. But when I was 16 I was wearing Black Cashmere. I also used Caress's Moroccan soap, which is very chai latte-ish. Why don't they do something more in that realm, I think it would be more appealing than synthetic strawberry. When I don't feel like choosing a perfume and just want to smell good I wear Ava Luxe Moroccan Mint Tea. Tea is just a really good idea. The new Ed Hardy Love & Luck Man is a knockoff of Bond's Wall Street. My husband tried the Ed Hardy sample and it smelled so familiar to me that I thought he was wearing Wall Street! Not the first time this scent has been duped, Sean John did it too. You cannot imagine how successfull Ed Hardy in germany is! Because Heidi Klum has the show Germany Next Topmodels and they get Ed hardy Stuff and this guy, Christian Audigier, runs around all the time. So all young gals and gents get the scent; it is the best sold at DOUGLAS, the biggest perfumery in Germany. mybeautyblog: Ah…wish I could see the German Top Model…have only seen the UK version (TRASHY!) and the Mexico version….